This article is about the City of Manchester in England. For other uses, see Manchester (disambiguation). Manchester is a city in North West England. In 2013 there were 514,417 people living there, which makes it the fifth largest city in the United Kingdom. It is a city and metropolitan borough of Greater Manchester, England. Manchester was given city status in 1853. 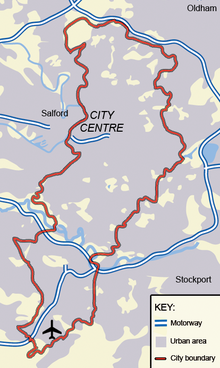 The city is in the middle of the Greater Manchester Urban Area, which has 2,240,230 people, and is the United Kingdom's third largest built-up place. Manchester is a very important city in England, and is often called the "Capital of the North". Manchester has many places for the arts, places for learning, businesses providing media as well as lots of shops. 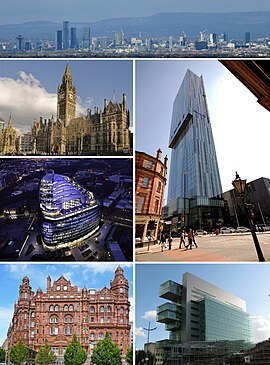 In a poll of British managers in 2006, Manchester was named the best place in Britain to have a business. A report in 2007 said Manchester is a fast-growing city (meaning lots of jobs are being created). Manchester was the host of the 2002 Commonwealth Games. It has two well-known football teams, Manchester United and Manchester City. Manchester was the first city to industrialise, because of the Industrial Revolution. It became the main place for making cloth and fabric. During the 19th century it had the nickname Cottonopolis, because it had so many cotton mills. The middle of Manchester is important because of its network of canals and mills built during its 19th-century development. The Peterloo Massacre of 1819 saw fifteen-twenty deaths and several hundred injured. In the late 18th century, Manchester was much smaller than it is today with about 40,000 people living there. This changed at the start of the Industrial Revolution. During this time, there were revolts about the living conditions for workers. The most well known of these revolts was the Peterloo Massacre. Fifteen to twenty people were killed during the Peterloo Massacre and hundreds of other people were hurt. In 1780, Richard Arkwright built the first cotton mill in the area. Later in the 1800s, Manchester became most important cotton town in the world. It was also the first 'industrialised' city, meaning that it was the first city to have a big amount of industry in it. Only a small amount of cloth is still made in the city and the trade has mainly stopped. This left a big number of old buildings from that time including the Town Hall, Free Trade Hall and Central Library and left a lot of other buildings empty. The Manchester Ship Canal was created by the digging of canals in the rivers Irwell and Mersey for 36 miles (58 km) from Salford to the Mersey estuary. This let ocean going ships sail into the Port of Manchester. The county of Greater Manchester was made in 1974. 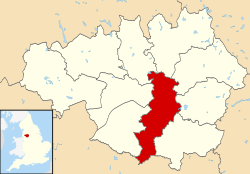 The county was created from cities and towns in southern Lancashire and northern Cheshire (the two main areas which make up Greater Manchester), and some mainly rural districts of Derbyshire and Yorkshire. In 1996, the Irish Republican Army put a bomb in a truck in the centre of the city. Nobody was killed, but it did a lot of damage. On 22 May 2017, A bombing occurred at the Manchester Arena with 22 people dead and 55 injured. It was a suicide bombing. The City of Manchester, the area is almost all "built-up". Manchester is 160 miles (257 km) northwest of England's capital, London. The city has many canals and rivers which were important to its growth, especially in the 18th and 19th centuries. The largest open space in the city is Heaton Park. It has an area of about 618 acres (250 ha). Heaton Park is a place that attracts many people every year. People go there to see the many animals and the beauty of the countryside. Much of Manchester is built-up (or 'urbanised'). Much of Manchester's rain comes over from the Pennines, which are hills to the east of the city. The city is mainly urban areas but also has some areas which are mainly of farmland. To the south of the centre is Manchester Airport. 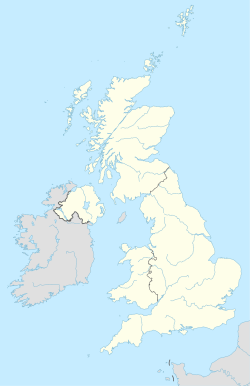 This is the third largest airport in the United Kingdom. A revival of the city's importance started in the 1980s. This was partly led by a vibrant music scene whose spirit was called 'Madchester'. It was led by bands such as The Happy Mondays and Joy Division. The Smiths came from nearby Salford. The scene was partly fuelled by the number of students attending the universities and further education colleges in the city. Manchester has the most students in the United Kingdom in term time. The University of Manchester is the largest university in the UK. It has over 30,000 students. The city also has the UK's fourth largest university, the Manchester Metropolitan University. The city has two Premier League football teams, Manchester City and Manchester United. Football is a very important part of the culture of the city. Many of the people support or show interest in the sport. A Metrolink tram going through the city centre. Manchester and North West England are served by Manchester Airport. The airport has the most passengers in the UK outside London, with 22.1 million passengers in 2007. Planes fly to lots of destinations in Europe, North America, the Caribbean, Africa, the Middle East and Asia (with more destinations from Manchester than from London Heathrow). Manchester is very well served by train and in terms of passengers, Manchester Piccadilly was the busiest English train station outside London in 2005 and 2006. Northern Rail operates all over the north of England, and other operators include Virgin Trains. The Liverpool and Manchester Railway was the first passenger railway in the world. Greater Manchester has a very big railway network. The city centre has over a lot of park and ride sites. Manchester became the first city in the UK to get a new tram system when the Manchester Metrolink opened in 1992. There are lots of new lines being built. The city has one of the biggest bus networks outside London with over 50 bus companies operating in the Greater Manchester area around the city. First Manchester and Stagecoach Manchester are the main bus operators. First Manchester also operates three free bus services called Metroshuttle which carry workers around Manchester's business areas. A big canal network runs though the city, built in the Industrial Revolution, today mainly used for leisure. The Manchester Ship Canal is open, but not many boats use it. Manchester's buildings display many different types of building styles, from Victorian to contemporary architecture. The very common use of red bricks characterises the look of the city. Much Manchester's architecture dates back to its days as a global centre for the trade of cotton. Just outside the city centre is a large number of former cotton mills, some of which have been left mostly untouched since they were closed, while many others have been turned into apartment buildings and office spaces.Manchester Town Hall, in Albert Square, was built in the gothic revival style and is thought of by many to be one of the most important Victorian buildings in all of England. There are two universities in the City of Manchester. The University of Manchester, created in 2004 when Victoria University of Manchester and UMIST were combined, is the largest full-time non-collegiate university in the United Kingdom. The Manchester Business School, at the University of Manchester, was the first school to offer an MBA course in the United Kingdom in 1965. Manchester Metropolitan University was created as Manchester Polytechnic on the merger of three colleges in 1970. It was given university status in 1992, and in the same year, combined with Crewe and Alsager College of Higher Education, in South Cheshire. Manchester has twinning plans (or "friendship agreements") with lots of places. In addition, the British Council has a "metropolitan centre" in Manchester. Although not an official twin city, Tampere, Finland is known as "the Manchester of Finland" – or "Manse" for short. Also, Ahmedabad, India became the centre of a booming textile industry, and it got the nickname "the Manchester of the East." ↑ "Manchester's Lord Mayor". Manchester.gov.uk. Retrieved 24 July 2015. ↑ "2011 Census – Key statistics for local authorities in England and Wales". ONS. Retrieved 7 November 2013. ↑ 3.0 3.1 "Global city GDP 2013–2014". Brookings Institution. Retrieved 25 March 2015. 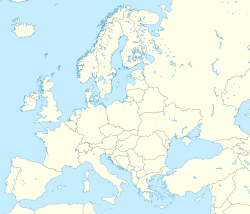 ↑ United Kingdom Census 2001 (2001). "Key Statistics for urban areas in England and Wales". statistics.gov.uk. Retrieved 2007-06-29. ↑ "Manchester "the north's dynamite capital"". England's North West. 2007. Retrieved 2007-09-11. • "About Manchester". The University of Manchester. 2003. Retrieved 2006-10-24. • "Northern Soul Club UK Life Guide". British Council. 2003. Retrieved 2006-10-24. ↑ "Britain's Best Cities 2005–2006 Executive Summary" (PDF). OMIS Research. 2006. Archived from the original (PDF) on 2007-11-26. Retrieved 2007-09-08. ↑ "Manchester – The State of the City". Manchester City Council. 2007. Retrieved 2007-09-11. ↑ Kidd, Alan (2006). 'Manchester: A History'. Lancaster, Lancashire: Carnegie Publishing Ltd. ISBN 1859361285. • Frangopulo, Nicholas (1977). Tradition in Action. The historical evolution of the Greater Manchester County. Wakefield: EP Publishing. ISBN 0715812033. • "Manchester United in Celebration of City". European Structural Funding. 2002. Retrieved 2006-12-18. ↑ 10.0 10.1 "Manchester Cottonopolis". Spinningtheweb.org.uk – Manchester City Council. 2005. Retrieved 2006-10-24. ↑ "Manchester and Salford (Ancoats, Castlefield and Worsley)". UNESCO. 1999. Retrieved 2006-10-24. ↑ Arrowsmith, Peter. "The population of Manchester from Ad 79 to 1801". Greater Manchester Archaeological Journal: 99-102. http://www.gmau.manchester.ac.uk/pdfs/gmac12.pdf. ↑ "Information". The Peterloo Massacre Memorial Campaign. Retrieved 2008-06-15. ↑ 14.0 14.1 Hartwell, Clare (2001). Pevsner Architectural Guides: Manchester. London, England: Penguin Books. pp. 11–17, 155, 256, 267–268. ISBN 0140711317. ↑ Hylton, Stuart (2003). A History of Manchester. Phillimore & Co Ltd. pp. 227–230. ISBN 1860772404. ↑ Rawlison, Kevin (22 May 2017). "Police warning after reports of explosion at Manchester Arena". The Guardian. Retrieved 22 May 2017. ↑ "Police respond to Manchester Arena blast reports". bbc.com. BBC News. 22 May 2017. Retrieved 22 May 2017. ↑ "Waterways in Manchester". Pennine Waterways. Retrieved 2009-10-04. ↑ "HeatonPark.org". Heaton Park. Retrieved 2009-10-04. ↑ Thomas, Lesley (2008-08-28). "Don't rain on our parade, Nemanja Vidic". Daily Telegraph. Retrieved 2009-10-04. ↑ "Manchester Airport". Manchester City Council. Retrieved 2009-10-04. ↑ "Rochdale claims its place in pop history". Manchester Evening News. 2009-09-26. Retrieved 2009-10-04. ↑ "Local Area Info". Retrieved 2009-10-23. ↑ 26.0 26.1 "Manchester still top of the popularity league". University of Manchester. 18 January 2007. Retrieved 2008-10-06. ↑ "Football fever". Visit Manchester web pages. Visit Manchester. Retrieved 2007-09-23. ↑ Wilson, James (26 April 2007). "A busy hub of connectivity". Financial Times – FT report – doing business in Manchester and the NorthWest. The Financial Times Limited. ↑ "Passenger Numbers 2005-06". Retrieved 2007-10-01. ↑ "GMPTE Park & Ride – Stations and Stops". GMPTE. 2007. Retrieved 2007-09-11. ↑ "Metrolink: a network for the twenty-first century" (PDF). GMPTE. 2002. Retrieved 2007-09-19. ↑ "GMPTE Trends and Statistics 2001/2002" (PDF). GMPTE. 2002. pp. Pg.&nbsp, 28–9. Retrieved 2007-09-19. ↑ Satchell, Clarissa (22 September 2005). "Free buses on another city route". Manchester Evening News. M.E.N media. Retrieved 2007-09-18. ↑ "North West Cities". Waterscape. British Waterways. 2007. Retrieved 2007-09-19. • Pivaro, Nigel (20 October 2006). "Ship canal cruising is all the rage". Manchester Evening News. M.E.N media. Retrieved 2007-09-19. ↑ Fowler, Alan (1994). Many Arts, Many Skills: Origins of Manchester Metropolitan University. Manchester: Manchester Metropolitan University. pp. 115–20, 226–8. ISBN 1-870355-05-9. ↑ Stevens, Val (18 May 2007). "Questions to the Deputy Leader in 2007". Manchester City Council web pages. Manchester City Council. Retrieved 2007-09-14. ↑ "Friendship Agreements". Manchester City Council. Archived from the original on 2012-06-04. Retrieved 2008-01-11. ↑ "British Council Annual Report". British Council. 2006. Retrieved 2007-07-07. ↑ Engineer, Ashgar Ali (2003). The Gujarat Carnage. Orient Longman. p. 196. ISBN 8125024964. ↑ Jawaharlal Nehru National Urban Renewal Mission (2006). "Profile of the City Ahmedabad" (PDF). Ahmedabad Municipal Corporation Ahmedabad, Urban Development Authority and CEPT University, Ahmedabad. Ahmedabad Municipal Corporation. Retrieved 2008-07-22. ↑ At the time of the twinning agreement, the city was in the German Democratic Republic and named Karl-Marx-Stadt. See "Friendship Agreements". Manchester City Council. Archived from the original on 2012-06-04. Retrieved 2008-01-11. Wikimedia Commons has media related to Manchester. "Manchester City Council". Retrieved 2009-10-24. "Visit Manchester, the official tourist board". Retrieved 2009-10-24. "The Official Manchester City Guide". Retrieved 2009-10-24. "Rail map of Greater Manchester" (PDF). Retrieved 2009-10-24. "National Statistics Profile". Retrieved 2009-10-24. This page was last changed on 4 January 2019, at 17:43.